A group of Taliban militants attacked an air force base in northwestern Pakistan early Friday, killing at least 29 people and wounding many others. Military spokesman Major-General Asim Bajaw told reporters that militants wearing paramilitary forces’ uniforms and entered the residential compound of the Badhaber base near Peshawar in two groups. One of the groups stormed a mosque where base staff were offering early morning prayers, he said, adding that the attack left 16 worshipers dead. The other group of militants attacked another area of the compound, killing several other people. Bajwa said a quick reaction force reached the base and engaged the attackers, killing 13 of the militants. He said an army officer and five security personnel were killed in the gunbattle, while 29 others, mostly soldiers, were wounded. General Bajwa alleged that the terrorist attack was planned in Afghanistan and those involved in it came from across the border. 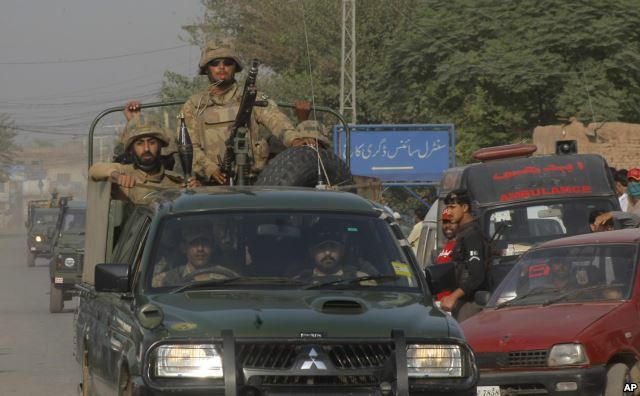 After the hourslong siege, Pakistan military chief General Raheel Sharif visited the base and met with security forces who took part in the counterterror operation. 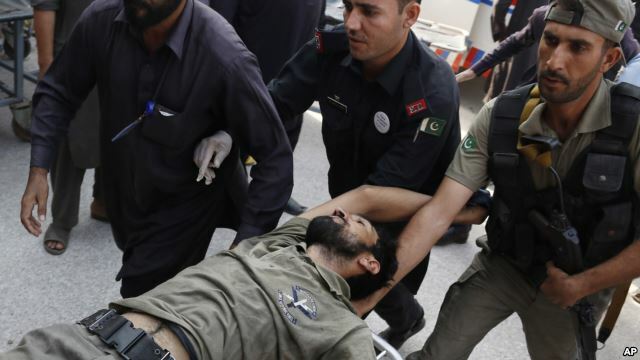 A spokesman for the Pakistani Taliban, Mohammad Khurasani, said its suicide bombers carried out the assault on the base, surrounding dozens of personnel and killing most of them. The claim could not verified independently. The Taliban spokesman later emailed a video to VOA. It shows 16 men being seen off by their superviser, saying they are the suicide bombers who took part in the air base attack. The Pakistani Taliban has been waging a bloody insurgency to impose its extreme brand of Islamic fundamentalism on the country and to avenge military attacks against its bases in northwestern tribal areas bordering Afghanistan. Tens of thousands of Pakistanis have died in the decade-long insurgency. However, authorities report a 70 percent decline in the violence, attributing it to the ongoing army offensive called Zarbe Azb launched in June 2014 in tribal areas and urban parts of Pakistan. Is Hong Kong’s Top Official Above the Law? Nearly one year after pro-democracy protests riled Hong Kong’s politics, the territory’s top official is coming under criticism for suggesting that his position “transcends” the other branches of government. Zhang Xiaoming, director of the Liaison Office of the Central People’s Government in Hong Kong, also denied that Hong Kong’s system endorses the separation of executive, legislative and judicial powers, saying such concept applies to sovereign states, not Hong Kong. The election decision, which said only Beijing-approved candidates could participate, and limited the field to three candidates, was taken as the latest sign of eroding freedoms in the former British colony. When Hong Kong was returned to China from the British in 1987 it was guaranteed freedoms that do not exist in mainland China under what is called the "one country two systems" model. Key parts of these differences include Hong Kong’s freewheeling capitalistic market system and freedom of the press and speech. The comments made by both Leung and Zhang highlight the deep divide that exists between those that feel the central government in Beijing should determine how Hong Kong's democracy develops and those who feel it is a matter for the port city's citizens to decide. They also highlight differences over basic ideas such as the rule of law. Albert Ho, a member of Hong Kong's Legislative Council says few Hong Kongers see eye to eye with Leung and Zhang. “Everybody should be equal before the law. Obviously he [Leung] should be subject to the Basic Law and to the laws in Hong Kong. 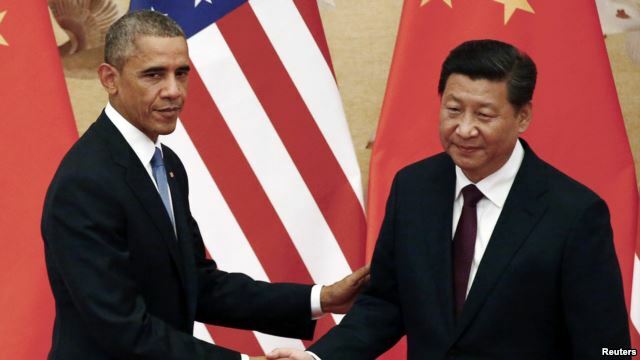 So, I think what he [Zhang] said is really nonsense,” said Ho. In a rebuke to the chief executive, the city’s Chief Justice Geoffrey Ma also took a strong stance to emphasize that the city has long ensured equality before law. “Judicial independence, this is specified in the Basic Law in three separate places. And I would ask people to read article 2, 19 and 85,” Ma told reporters this week. Critics say Zhang’s controversial remarks reflect Beijing’s long-held views, and came at a time when chief executive Leung’s popularity was at a new low. “Beijing would like to rescue his [Leung’s] plunging authority in the remaining two years of his term, in particular, when Beijing sees the danger of the further plunging of his popularity given the possible, imminent economic trouble ahead of Hong Kong,” said Dixon Sing, associate professor of the Hong Kong University of Science and Technology's social science division. 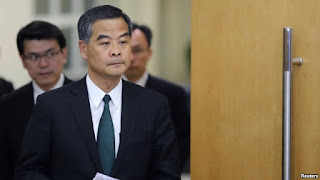 Though Leung may not be Beijing’s choice for running in the city’s next chief executive election in 2017, Sing said authorities in China cannot allow his credibility to further weaken because it will undermine the central government’s control. The professor said Zhang’s comments, apparently aimed at boosting the chief executive, have backfired as they pose a threat to the city’s legal cornerstone.